Current procedure under the CPC provides that a persons with mental disability can be acquitted of a crime. Where there is sufficient ground the person can be found guilty of a crime. This is dependent on the psychological and probation report presented before the Court. The Kenya National Human Rights Commission 2011 report titled Silenced Minds: The Systematic Neglect of the Mental Health System in Kenya, showed that persons with mental disabilities in Kenya’s institutions did not know their rights or where to seek redress. This makes the criminal justice system inaccessible resulting in institutionalization for indefinite periods. The Court has discretion on sentencing under Section 167(1) of the CPC but rarely do courts question the psychiatrist report or seek alternative measures from the probation officer. There are no guidelines on sentencing ‘at the president’s pleasure’. One does not know if the sentence can be reviewed, when it can be reviewed, procedure for release or even the rights of persons with mental disabilities while serving the sentence. Consequently Section 167(1) of the CPC becomes a tool for institutionalising persons for life. This results in a violation of the right to liberty and the right to live in the community as enshrined by the CRPD and Kenya’s Constitution. Courts may also consider the person’s living and financial circumstances during mitigation. Most cultures in Kenya believe that person with mental disabilities are cursed. Thus a community may attack or outcast a person with disability; See case of Katana Karisa and 4 others v. Republic, Criminal Appeal 372 of 2006, where a blind man who was accused of being a witchdoctor was murdered by the community. Secondly a 2009 World Bank report on poverty put Kenya’s poverty rate at 42%. Families do not have the financial ability to take care of a person with mental disability. Thus when faced with mental disability, the courts have a further dilemma of ensuring the safety and access to services of the person. On one hand the provision of ‘at the president’s pleasure’ serves as a protection for persons with disabilities likely to be attacked by the community, a means to receive services such as healthcare (though limited), food and shelter. However institutionalization on the basis of disability is a violation under Article 14 of the CRPD. The Court relies solely on the psychological report and probation officer without seeking alternatives. Persons with Mental disabilities as indicated earlier are unaware of their rights thus will admit to anything leading to a miscarriage of justice. Therefore for Article 14 and 19 of the CRPD to be realized in Kenya, Section 167(1) of the CPC needs to be repealed. 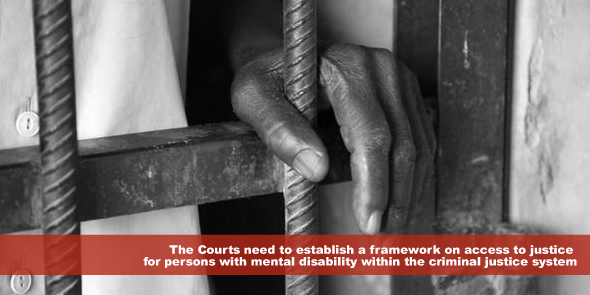 The Courts need to establish a framework on access to justice for persons with mental disability within the criminal justice system. Finally probation officers need to create awareness within the community on mental disability to allow persons to live in the community without fear and on an equal basis with others. Felicia Mburu is a Human Rights advocate with a passion for disability rights and strategic impact litigation. Felicia started out as a private practice lawyer in Kenya before transitioning to child rights advocacy in 2012. As an advocate, Felicia oversaw projects on child rights governance and child budgeting especially for children with disabilities. In 2013 she was awarded the Open Society Disability Rights Scholarship to pursue a Masters in International Legal Studies specializing in Human Rights Law at American University, Washington College of Law. She also interned with Quality Trust for Individuals with Disabilities and as a Foreign Legal Specialist with the Public International Law Policy Group in Washington DC, USA. In August 2014 she returned to Kenya where she works as a Project Assistant on gender based violence in Kenya. thanks dear Felicia for your report which raised an important issue relates to the people with disabilities’ rights. again appreciate to you as you promote such rights. am also a lawyer from Sudan as also Master’s Student of human rights law. am also little familiar on Kenya’s laws but I believe that there are many areas of our national laws need to be noted and developed in order to comply the standards of international human rights law especial which deal with gender based violence,as well disabilities people rights. this regard we as lawyers of human rights in the continent have responsibilities to promote, protect as well to ensure its implementation on the roots grass, through workshops and appearance before our constitutional courts. hi,what are the citations for the Nawya case?